Pets Costs > How Much Does a Garra Rufa Fish Cost? How Much Does a Garra Rufa Fish Cost? The Garra Rufa fish, also known as the doctor fish, is used to treat many common skin disorders. Even with the advent of modern medicine, people still resort to traditional methods of finding the cure to specific illnesses. Some people may find it weird to consider a fish nibbling at your skin as a treatment, but this is considered by an increasing number of people. The Garra Rufa originated in Turkey, but it has become very popular around the world in several salons since these fish will nibble on the dead cells of the feet, improving the smoothness. These benefits were discovered in the early 19th century by a bather with psoriasis who need to improve his skin. How much a Garra Rufa fish cost? The cost of a Garra Rufa can cost $2 to $11 per fish, and it will really depend on the type and where it’s purchased from. For example, the Garra Rufa Obtuse can cost $7 to $11 per fish. On a forum thread on the website, allaquariuminfo.com, a member noted she paid $3.49 per fish. If you’re coming here to learn about a salon massage which includes the Garra Rufa, then the average session price can be $30 to $45 for a 15 to 20-minute session. This fish is famously known for eating dead skin while leaving the healthy skin untouched. It’s commonly found at many salons across the world. Most aquariums will either sell them as adults, juveniles or as a fry. Like keeping any fish, you will need the necessary startup supplies such as a fish tank ($30), filter ($20) and lighting ($10). The ideal set up for these type of fish is going to include a water pump filter, a UV filter, an ozone system and air pump. As for the tank, plan on at least one gallon per inch. Fish food will need to be purchased every few months and shouldn’t cost more than $5. Since they come from a place that has little food, flakes will suffice. 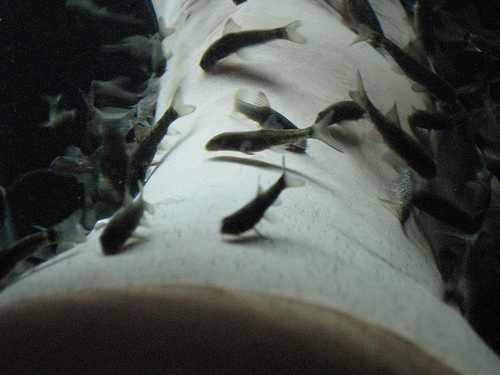 Since these fish are considered tropical, they will thrive in tanks with heaters, so a heater will be recommended. Since most are available by importing them, delivery charges may occur. Some of the stores charge as much as $10 per fish to deliver. The Garra Rufa prefers to be in at least groups of 6 to 12. This fish is found in the river basins of Turkey, Syria, Iraq and Iran. One of the most common killers of the Garra Rufa fish is high ammonia and nitrate levels. It’s very important that the tank has a great filtration system. According to a British science study, these fish have been known to be responsible for a variety of dangerous skin and soft tissue infections. This practice has been banned in 14 states since regulations state salons must sanitize or discard tools after usage. Since these fish could be expensive to throw away and/or are impossible to sanitize, salons won’t be able to meet these compliance standards. It’s advised to wait at least 24 hours before going to a spa if you recently shaved or had a leg wax. Those who have diabetes or psoriasis shouldn’t use these spas at all. The Psoriasis Association said people who have psoriasis increase the chances of picking up an infection if they were to have an open lesion on their feet. Aside from removing the dead skin cells, these fish are known to stimulate your blood flow, increasing your circulation. It can also help with food odor, athlete’s foot and help stimulate acupuncture points, helping the nervous system. To purchase these fish, you commonly have to search online since most local pet stores won’t have them in stock.